This exhibition, Sound In Light - Light In Sound serves both as a retrospective of this graphic innovation and an introduction to new works. To be presented at arToxin will be Foliage prints and movie, the Sylva Sylvarum movie, prints of the Hudson River Compositions, IX - In Memoriam Iannis Xenakis, Mare Undarum, and a new work. For the vernissage, Sharp will perform realizations of Sylva Sylvarum and the latest score. During the course of the exhibition, invited musicians will present their interpretations of selected works. Considered a central figure in the experimental music scene in New York City since the late 1970's, composer and multi-instrumentalist Sharp has long nurtured a strong relationship with the visual arts with experiments in graphic notation and algorithmic composition dating back to the early 1970's with his Hudson River Compositions. Beginning with the 2007 work Seize Seas Seeths Seen, Sharp invented a new technique for creating scores that would transmit performance information to the participating players while translating the musical elements into a form that also functioned as retinal art. In this process, musical materials composed in a notation program would be treated as raw graphic material. Using Photoshop, GIMP, and other graphic editing software, Sharp employed processing strategies such as feedback, modulation by waveforms, and image distortions in much the same way that he would perform live mixing on musicians realizing his compositions. The results were unique and compelling and found great resonance with Sharp's musical colleagues. In 2012, the major work Foliage was created: over 250 images using these processing strategies. 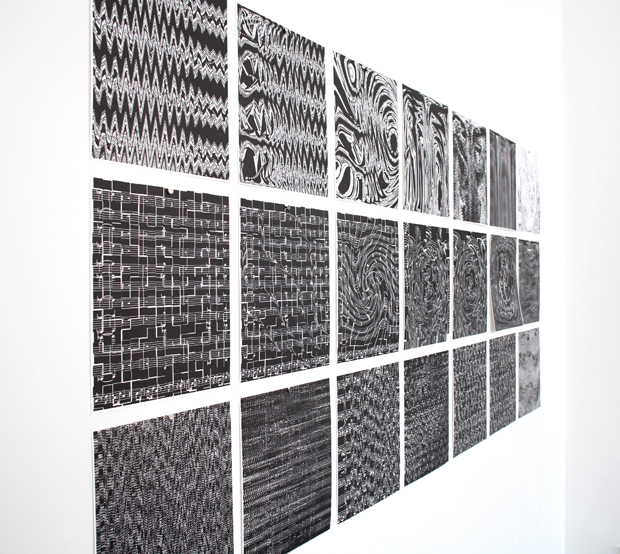 A resulting exhibition presented 80 of these images in the form of Risograph prints as well an animated version of Foliage in the form of a 30-minute movie. Musicians could perform from the exhibited prints or with the movie, using either as score. Foliage was performed in New York by such players as Sirius String Quartet, Mary Halvorson, Dither Guitar Quartet, Tracie Morris, Luke DuBois, and Mivos String Quartet and internationally by a variety of ensembles and soloists throughout Europe and Japan. Foliage was followed up in 2014 with Sylva Sylvarum, a graphic score existing solely in the form of a movie made from 240 frames created using this process and premiered by Sharp's ensemble SysOrk in NYC and performed throughout the US, Canada, and Europe.